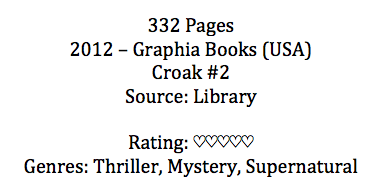 Due to the first book being a mystery-thriller, I don’t want to spoil the ‘who dunnit’ at the end of Croak. There will be no summary, only my response to the book. For information on the first book in this series: CLICK HERE. Love, love, love, love, love, love, love!!!!!! You know that feeling when you’re reading Catching Fire by Suzanne Collins? Well, that is exactly how I felt when reading this action packed, high speed sequel! Damico doesn’t hold back and there are brilliant new settings and shocking events that will make you wonder if you just read that chapter right. I poured over this book in two days and I can’t wait for the third and final book to come out next month! I’m dying (!!!) to know what happens next! Picking up where she left off, Damico does an amazing job of continuing this amazing story and keeping her readers on their toes. I’ve fallen in love with this series and I hope my expectations of the last book aren’t to high, but I’m pretty confident that Damico can finish her series in style! If you haven’t read either book, go do so (RIGHT NOW!)! We’ll have long chats over tea until the third book, Rogue comes out September 10th!